After receiving report from Bureau of Immigration regarding visa violations committed by Bangladeshi actor Ferdous Ahmed who campaigned for TMC, MHA has cancelled his business visa and issued him a leave India notice. He also has been blacklisted. Accepting the recommendation of EC dated 14 April, President Ram Nath Kovind has rescinded the election to Vellore parliamentary constituency in Tamil Nadu. The move came following the seizure of over Rs 11 crore cash from a warehouse in Vellore district. The Election Commission on Tuesday ordered re-poll in 19 polling stations of Outer Manipur parliamentary constituency following complaints of voter intimidation by militants and destruction of EVMs and VVPATs. Repolling in these polling stations spread over four districts — Senapati, Chandel, Churachandpur and Ukhrul — will be held on 18 April, the same day of voting for Inner Manipur Lok Sabha seat, according to an order by the Election Commission. Congress MP Shashi Tharoor suffered head injuries while performing 'Tulabharam' ritual at a temple in Thiruvananthapuram on Monday. Congress president Rahul Gandhi said at the Thiruvananthapuram rally, "I was quite worried when Tharoor got hurt. But I'm happy to see that he's back in action pretty quickly. It tells you about his spirit. He has represented you extremely well in the Parliament. He's an asset to Kerala and to the Congress. So, you have to make sure that he wins the election." Congress president Rahul Gandhi accused Prime Minister Narendra Modi of politicising armed forces. "When Pulwama took place, my immediate reaction was 'I'm not going to politicise this issue'. This is not a political issue. I refuse to exploit our jawans politically. But that is not how the prime minister thinks. The prime minister exploits the valour of our jawans politically for his own good. And if the army and air force do something, the credit is theirs. It is shameful that the prime minister doesn't give them credit, because they're the people who give their blood. They deserve the credit and nobody else," he said. In Thiruvananthapuram, Rahul Gandhi said, "The fishermen who saved thousands of lives during floods, who sacrificed everything they had to protect the people, we ask them, what would you like us to do? How can we honour what you've done? We have unique problems. The voice of our brave fishermen is in our manifesto. The moment we win the election, fishermen will have their own ministry in Delhi. All we did was listen to the voice of the Indians." "Narendra Modi demonetised the economy, we will remonetise the economy. Frankly, there's no other choice other than remonetising the economy," Rahul Gandhi said while addressing a public meeting in Thiruvananthapuram. "The Congress will come to power in 2019. NYAY will put the fuel into the Indian economy engine and you will see the impact of the scheme in a couple of months. The vibrancy will come back, and millions of jobs would be created. But we don't want to stop there. We want to aggressively fight unemployment." He further said: "The truth is we can remonetise the economy and give 22 lakh government jobs, 10 lakh jobs in the panchayats. We want to unleash India's youngsters, we want to free India's job creation army." Rahul Gandhi lashed out at Prime Minister Narendra Modi over Rafale deal and claimed that Modi failed to answer his questions on the agreement. "He didn't mention Rafale or Anil Ambani (in Modi's response in the Parliament). The old slogan was 'ache din ayenge', the new slogan is 'chowkidar chor hai'." Addressing a rally in Thiruvananthapuram, Congress president Rahul Gandhi said, "We understand that hatred hurts India. Division hurts India. Love, united strengthens India. You've seen the BJP government for five years. Their slogan was 'acche din ayenge'. Today we have the highest unemployment rate in 45 years, the highest suicide rate of farmers. He targetted businessman Anil Ambani and the Centre over Rafale deal. "His (Anil Ambani) brother had to pay his debts to keep him out of jail but for some reason he was given the biggest defence contract in the world," he said. Bihar BJP vice-president Devesh Kumar said, "We met Election Commission and made them aware of Punjab minister Navjot Singh Sidhu's statement made at a rally in Katihar, earlier today (Tuesday). They said they have seen the footage and have assured us that necessary action will be taken." Amit Shah claimed in Thrissur that over 120 workers of the BJP and RSS had been murdered in Kerala till date. "I want to ask the Kerala chief minister, why have most of these murders taken place in your district? You must take responsibility." He further alleged, "Under Pinarayi Vijayan government, 525 incidents of mob lynching and violence have taken place... The Kerala government also unleashed violence on the devotees of Sabarimala in the name of implementing the Supreme Court order. What message does the Kerala chief minister want to send through the violence on the devotees?" Addressing a public meeting in Thrissur, BJP chief Amit Shah said, "UPA government gave Rs 45,393 crore under the 13th Finance Commission. However, in five years, NDA govt gave Rs 1.98 lakh crore to Kerala under 14th Finance Commission." In Amravati, Shiv Sena chief Uddhav Thackeray said Tuesday that the Congress-NCP alliance in Maharashtra lacked both leaders and direction. The Sena-BJP alliance will win all the 48 Lok Sabha​ seats in the state, Thackeray said, addressing a campaign rally for sitting MP and Sena candidate Anandrao Adsul. 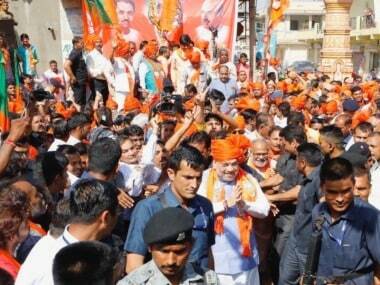 Congress asks EC to act against Modi over 'mysterious property' in Gandhinagar. Congress on Tuesday claimed that Prime Minister Narendra Modi submitted wrong information in his affidavits over the years regarding a land owned by him in Gandhinagar. "The Congress demands that the Election Commission of India takes thorough cognisance of the seemingly deliberate omissions in Modi's affidavite and take appropriate action under the Representatin of People Act," it said. The Election Commission (EC) has issued a show cause notice to Union minister and BJP MP from Jodhpur Gajendra Singh Shekhawat for violating Model Code of Conduct (MCC) by warning government officials and threatening to “hang them upside down” while addressing an election meeting in Pokhran on Sunday night. The BJP candidate from Jodhpur Lok Sabha seat was angered apparently by the videography of vehicles during his election meeting in Pokhran. The videography was carried following a notice from the sub-divisional magistrate stating that the expenditure on vehicles used by Shekhawat in the meeting would be added to his total campaign cost. "This is not the last election. I have details of all officials. The government would change after five years. I would hang all of them upside down then," Shekhawat had purportedly said. Addressing a rally in Kerala's Alappuzha, Congress president Rahul Gandhi said, "We're currently involved in an ideological fight between the Congress and the BJP-RSS. The Congress views India in a particular way and the RSS views India in a completely different way. We say that India should be represented by the voice of its people. We say that we should accept many different idea, languages, cultures." "That's not how they see India; they want India to be ruled by one idea and they want to crush anybody who does not agree with their idea. The prime minister can announce from a stage Congress-mukt Bharat. He says he wants to eliminate Congress and its ideas. We do not say that, we don't want the elimination of anybody. We disagree the BJP and the RSS, we fight with them, but we will never kill BJP and RSS. We will never use violence against our opponents. Even when we are fighting our opponents, we will do so with love, respect and compassion. And the history of this state and country will show you that in this country love will always triumphs over hate." The Centre sought a report from the Foreigner Regional Registration Officer (FRRO) in Kolkata on Bangladeshi actor Ferdous Ahmed allegedly campaigning for a Trinamool Congress candidate for the Lok Sabha polls, officials said. The move comes following reports that Ferdous Ahmed, along with a few Indian actors, allegedly took part in campaigning for TMC's Raiganj candidate Kanhaiyalal Agarwal. The Foreigner Regional Registration Officer (FRRO) Kolkata has been asked to send a detailed report whether Ahmed has violated visa conditions by allegedly participating in the Lok Sabha poll campaigning. Ahmed is said to be visiting India on a business visa. Against the backdrop of Congress president Rahul Gandhi's 'saare Modi chor hai' remark, Prime Minister Narendra Modi said on Tuesday, "These people are crossing limits daily. According to them anyone whose name is Modi is a thief, What kind of politics is this? They have labelled a whole community as thieves only to get some applause, just to insult your chowkidar." Samajwadi Party leader Ravidas Mehrotra said that Shatrughan Sinha's wife Poonam Sinha will be the SP-BSP-RLD candidate from Lucknow. She will file nomination on 18 April. "We appeal to the Congress that do not field your candidate from here so that BJP can be defeated," he was quoted as saying by ANI. The Samajwadi Party's official Twitter handle has welcomed Poonam Sinha to the fold. Sinha met Akhilesh Yadav's wife Dimple on the occasion. Shatrughan Sinha's wife Poonam has reportedly joined the Samajwadi Party, say reports. SP is expected to announce her name as Lucknow candidate soon. Poonam Sinha, newly anointed Congress leader Shatrughan Sinha's wife, is likely to go against Rajnath Singh from the Lucknow constituency. The fact that Congress has not fielded anyone from the crucial constituency yet is being considered significant enough to suggest that Sinha will have the backing of Congress, SP and BSP. Bharatiya Janata Party (BJP) president Amit Shah began his roadshow in Tumakuru, Karnataka on Wednesday. Former prime minister and JDS chief HD Deve Gowda will contest from Tumakuru in the 2019 general election. Congress president Rahul Gandhi visited the house of recently deceased Congress leader KM Mani on Tuesday. "I will file a defamation case against Rahul Gandhi in Patna High Court within two days," Modi told reporters in Patna. The BJP leader claimed that Rahul has hurt the sentiments of crores of people with Modi surname. The deputy chief minister said, "He (Rahul Gandhi) has referred to crores of people with 'Modi' surname as 'chor' and hurt their sentiments." The Suheldev Bharatiya Samaj Party (SBSP), an ally of the BJP in Uttar Pradesh, Tuesday announced it will go alone in the ongoing Lok Sabha polls in the state and released a list of 39 candidates. Party chief and state minister Om Prakash Rajbhar said his party has decided to field its candidates as the seat-sharing talks with the BJP remained unsuccessful. Notwithstanding the fact that as many as four prominent politicians are currently suffering campaign bans by the EC for polarising comments, Congress leader Navjot Singh Sidhu, at a rally in Bihar's Katihar, appealed to the Muslim voters to vote for the Congress. "My Muslim brothers and sisters, you must vote for the Congress. If you show solidarity, nobody can defeat your candidate. You are not a minority but a majority," he said. "There is a namdaar who said recently that all Modis are thieves. Those of you here who are named 'Sahoo', if you went to Gujarat, you would be called 'Modi'. So tell me, are you all thieves? Should we believe that we are all thieves? Are you going to let this go without giving an apt reply to those who say things like this?" Modi asked his Korba audience. Congress chief Rahul Gandhi had on Monday said at a campaign speech that all Modis were thieves. Narendra Modi is addressing his second rally of the day, at Korba in Chhattisgarh. Almost immediately after taking stage, the prime minister blamed the Congress for siding with Naxals and people who wanted to "divide" India. Communist Party of India (CPI) candidate for Inner Manipur Lok Sabha constituency, M Nara Singh campaigns in the constituency. Lok Sabha polls in the state will be held for one out of two seats on 18 April. Voting for Outer Manipur Lok Sabha constituency was held on 11 Apr. BJP's JP Majumdar held a press meet in Kolkata after meeting the Election Commission over Bangladeshi actor Ferdous campaigning for Trinamool. "We understand that foreign nationals can't participate in the electioneering process in India. When TMC is using Bangladeshi nationals for campaigning, they are breaking the rules. He should be arrested for breach of visa rules," Majumdar told ANI. Speaking at Attingal, at a campaign rally, the BJP's Kerala chief Sreedharan Pillai remarked that Muslims can be identified by “removing their clothes”, in a reference to circumcision. Pillai, supporting BJP’s Attingal candidate Sobha Surendran was referring to the questions raised by the Opposition on the number of people killed in the Balakot air strikes. The Election Commission of India's flying squad conducted checks on the luggage of former Karnataka chief minister and BJP leader BS Yeddyurappa at a helipad in Shivamogga. In what has proven to be quite a busy day for poll-related developments and fervent campaigns, Rahul Gandhi said in his second rally of the day at Kerala's Pathanamthitta that the Congress will will spend money on education, healthcare and hospitals if it comes to power in 2019. "Modi has reduced the amount of money spent on education drastically. This is a shame. We have a target of spending 6 percent of the GDP on education. We want the poorest and weakest people to have access to the best education and healthcare systems," Rahul said. A BJP delegation comprising senior leaders Mukhtar Abbas Naqvi and Jagat Prakash Nadda, will approach the Election Commission later on Tuesday against the campaign ban on UP chief minister Yogi Adityanath, ANI has reported. Union minister Rajyavardhan Singh Rathore filed his nomination from Jaipur parliamentary constituency in the presence of yoga guru Ramdev and wife Gayathri. Speaking at Davanegere on Tuesday, Amit Shah went back to one of the most troubling topics on the campaign trail: the issue of Kashmir. "For as long as there are BJP karyakartas, Kashmir will remain a part of India," he said, adding that it did not matter what Rahul Gandhi and Omar Abdullah were saying. Rajnath Singh has filed his nomination from the Lucknow seat. Amit Shah has begun to address his first public meeting of the day at Davanagere in Karnataka. Immediately upon taking stage, Shah hit out at the mahagathbandhan, saying that if "somehow" the mahamilavat forms a government in the country, the leaders of different political parties of the opposition will "take turns" to become the prime minister, throwing the nation into disarray. Azam Khan's son, Abdullah Azam Khan, alleged on Tuesday that the Election Commission has been banned from campaigning because he is a Muslim. "Because Yogi Adityanath was banned, they saw it fit to ban a Muslim man too," he said. 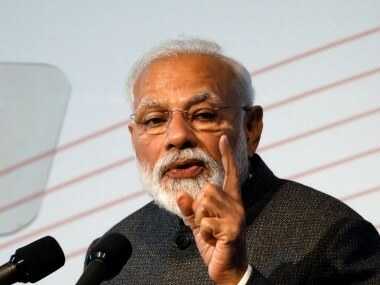 Two Railway employees have been suspended after tickets with photos of Prime Minister Narendra Modi printed on them were issued to passengers at Barabanki railway station in Uttar Pradesh on Tuesday. BJP leader Mukul Roy, who was once Mamata Banerjee's man friday, led the charge against Trinamool Congress after it engaged Bangladeshi actor Ferdous to campaign for its Lok Sabha candidate Kanaia Lal Agarwal from Raiganj in North Dinajpur district. The saffron party has complained to the EC in this regard, reports said. Senior Principal Secretary in the EC KF Wilfred told News18 that there is "no such specific rule, but we need to look in to his (Ferdous’) purpose of visit when he applied for visa." Prakash Raj is contesting from the Bengaluru Central Lok Sabha seat as an independent candidate. On the campaign trail on Tuesday, he said, "I'm not fighting against anyone. I'm fighting for the people." Hitting out once again at the Naveen Patnaik government, PM Narendra Modi said on Tuesday that the Naveen Patnaik government at Odisha had pocketed 85 percent of the money that the Centre had sent to the state. "You tell me, how will development happen then," he asked, pointing out that most of Odisha's people were wracked by poverty years after Independence because "Congress and BJD have been in power in the state." In frenzy we have seen before as leaders went to respective Collectorates to file their nomination papers, Union Minister and BJP leader Rajnath Singh too is leading a populated roadshow ahead of filing his nomination from the Lucknow Parliamentary seat. "The money for NYAY will come from the likes of Anil Ambani. Not honest businessmen, not fair people. We will make sure that those who have stolen from you pay you back," Rahul Gandhi said at Kollam on Tuesday. He spoke at length on the Congress's manifesto. At the rally, Rahul also made several promises in line with what the party has promised in its manifesto, including a single cell clearance platform for permissions for new businesses. "I insisted that the money from NYAY be sent to women because I knew that women were better at money. I know the men will not be happy with this," said Rahul to loud laughter and applause, at his Kollam rally on Tuesday. The Congress chief, speaking in English and with a Tamil interpreter on stage, hit out at the BJP over the Rafale scam, the charge that the BJP has made it easy for the rich to get richer and the rule of the RSS. Mayawati on Tuesday, did not get the relief she was hoping for, from the Supreme Court. The BSP chief, challenging the Election Commission ban on her campaigning for 48 hours starting 6 am today, was told by the Supreme Court to file a separate petition if she was "aggrieved". The Supreme Court on Tuesday, after summoning the Election Commission on Monday, appreciated the poll watchdog for taking action on political leaders spewing hate speech. The poll watchdog has barred Samajwadi Party leader Azam Khan and Uttar Pradesh chief minister Yogi Adityanath from campaigning for 72 hours and Union minister Maneka Gandhi and Bahujan Samaj Party chief Mayawati for 48 hours. This was after the Supreme Court had criticised the Election Commission for not taking concrete action against disrespectful or communally-coloured speeches being political leaders and had called it a"toothless body". Ahead of the 18 April election, preparations are underway in Ramanathapuram parliamentary constituency of Tamil Nadu where Prime Minister Narendra Modi addressed a rally on Saturday. Union Home Minister and BJP candidate from Lucknow, Rajnath Singh will file his nomination papers on Tuesday. Ahead of the roadshow, Rajnath visited the Hanuman Setu temple in the city. He is likely to be accompanied by senior leaders including Mahendra Nath Pandey, Deputy CM of UP KP Maurya, Dinesh Sharma, MoS Home Hansraj Ahir, Kalraj Mishra. Singh is also expected to hold a road show from party office to the collectorate. The frantic campaign pitches of the two-month-long Lok Sabha election process saw a small reprieve on Tuesday when Congress MP Shashi Tharoor tweeted that BJP minister Nirmala Sitharaman had been to visit him in the hospital in spite of a demanding campaign schedule. Tharoor had been hospitalised after hurting himself during a temple visit on Monday. Like Congress president Rahul Gandhi, BJP chief Amit Shah will also address rallies in Kerala. He will, however, begin the day with meetings at Karnataka. Congress president Rahul Gandhi will be in Kerala on Tuesday and Wednesday, covering several districts including his second constituency of Wayanad. Prime Minister Narendra Modi is expected to address rallies criss-crossing Odisha and Chhattisgarh, at Sambalpur, Korba, Bhatapara and Bhubaneswar. BSP chief Mayawati's nephew and SP leader Azam Khan's son Tuesday filled in for the two Uttar Pradesh heavyweights on Tuesday, the final day of electioneering for the second phase of polling in the state. Bahujan Samaj Party supremo's nephew Akash Anand delivered his first political speech in Nagina, where Mayawati was initially scheduled to address a joint opposition alliance meeting. Azam Khan's son Abdullah addressed a press conference in Rampur, criticising the Election Commission order. The Election Commission had Monday barred the two leaders — as well as Uttar Pradesh chief minister Yogi Adityanath and BJP's Maneka Gandhi — from campaigning for varying periods over violations of the Model Code of Conduct. Holding a roadshow in Tiravarur, DMK leader MK Stalin said, "This (AIADMK-BJP) is an inefficient alliance. Remember, these people introduced GST, promising that rates of essential goods will come down. But you tell me, prices of which things have come down?" The Election Commission has sought report from the Katihar district magistration on Congress leader Navjot Singh Sidhu's speech in which he reportedly appealed to the Muslims not to split their votes. Addressing a press conference, BJP leader and Union law minister Ravi Shankar Prasad lashed out at Congress leader Navjot Singh Sidhu over his speech allegedly seeking Muslim votes, and said, "Divisive politics is in Congress' DNA. It's nothing new. When slogans were being raised in JNU to divide India, then Rahul Gandhi had gone there to support them." Hitting out at NC leader Farooq Abdullah for his recent remarks, Prasad said, "These days, there are voices from Kashmir claiming that India can be divided whenever they want. Priyanka Gandhi needs to understand the mentality of the tukde-tukde gang. Rahul Gandhi's move to contest from Wayanad also encourages this." 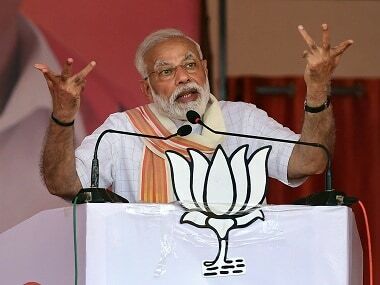 Addressing a rally in Bhatapara, Prime Minister Narendra Modi said, "Today, India enters Pakistan and performs surgical strikes. Today, India kills the terrorists by entering their house. Today, India can spot a missile in space.​ Modi did not do all this; this was possible becayse of your one vote." Lok Sabha Election 2019 LATEST updates, 2nd Phase of voting will be held on 18 April: The Ministry of Home Affairs has cancelled the business visa of Bangladeshi actor Ferdous Ahmed, who allegedly campaigned for the Trinamool Congress in West Bengal. He has also been blacklisted. Accepting the recommendation of Election Commission dated 14 April, President Ram Nath Kovind has rescinded the election to Vellore parliamentary constituency in Tamil Nadu. The move came following the seizure of over Rs 11 crore cash from a warehouse in Vellore district. In Thiruvananthapuram, Congress president Rahul Gandhi said, "When Pulwama attack took place, my immediate reaction was 'I'm not going to politicise this issue'... But that is not how the prime minister thinks. The prime minister exploits the valour of our jawans politically for his own good. And if the army and air force do something, the credit is theirs. It is shameful that the prime minister doesn't give them credit, because they're the people who give their blood. They deserve the credit and nobody else." 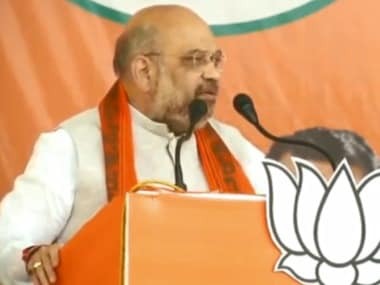 Addressing a rally in Thrissur, BJP chief Amit Shah alleged, "Under Pinarayi Vijayan government, 525 incidents of mob lynching and violence have taken place... The Kerala government also unleashed violence on the devotees of Sabarimala in the name of implementing the Supreme Court order. What message does the Kerala chief minister want to send through the violence on the devotees?" Addressing a rally in Kerala's Alappuzha, Congress president Rahul Gandhi claimed that the BJP and RSS want India to be ruled by one idea and they want to "crush anybody" who does not agree with them. "The prime minister can announce from a stage Congress-mukt Bharat. He says he wants to eliminate Congress and its ideas. We do not say that, we don't want the elimination of anybody. We disagree the BJP and the RSS, we fight with them, but we will never kill BJP and RSS," he said. Samajwadi Party leader Ravidas Mehrotra said that Shatrughan Sinha's wife Poonam Sinha will be the SP-BSP-RLD candidate from Lucknow. She will file nomination on 18 April. "We appeal to the Congress that do not field your candidate from here so that BJP can be defeated," he said. Earlier, there were speculations about Poonam being pitted against Rajnath Singh from the Lucknow constituency after she joined the Samajwadi Party on Tuesday. The fact that Congress has not fielded anyone from the crucial constituency yet is being considered significant enough to suggest that she will have the backing of Congress, SP and BSP. BJP chief Amit Shah has been addressing rallies in Karnataka today. After prayers at the Siddaganga mutt in Tumakuru, for what reports said was "the electoral victory of Prime Minister Narendra Modi", Shah led a roadshow through the town. Prime Minister Narendra Modi is addressing his second rally of the day, at Korba in Chhattisgarh. Almost immediately after taking stage, the prime minister blamed the Congress for siding with Naxals and people who wanted to "divide" India. "They had labelled Naxals revolutionaries, and had raised the morale Naxals," he said. In the presence of senior BJP leaders, Home minister Rajnath Singh is now filing his nomination papers from the Lucknow constituency, at the Collectorate. Rajnath had earlier tweeted that he is eager to fulfill the dreams of Atal Bihari Vajpayee for the city. Congress chief Rahul Gandhi, speaking at a mega show in Kerala's Kollam, circled back to the Rafale scam, notwithstanding the backlash to his harnessing of the case. In Lucknow, meanwhile, Rajnath Singh's roadshow has taken off. The Home Minister will file his nomination papers from the Collectorate soon. The poll watchdog has barred Samajwadi Party leader Azam Khan and Uttar Pradesh chief minister Yogi Adityanath from campaigning for 72 hours and Union minister Maneka Gandhi and Bahujan Samaj Party chief Mayawati for 48 hours. This was after the Supreme Court had criticised the Election Commission for not taking concrete action against disrespectful or communally-coloured speeches being political leaders and had called it a"toothless body". 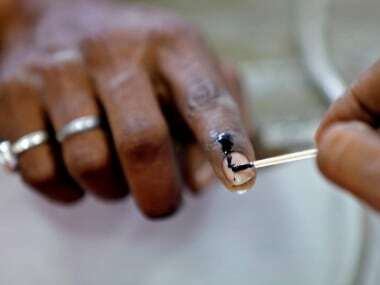 The Election Commission has also hogged the limelight over a confusion regarding whether it has set the wheels in motion to cancel the Vellore Lok Sabha constituency election, scheduled for Phase 2 on Thursday. While it said it has not issue an "order" in the matter, several media reports say that the poll body has recommended to President Ram Nath Kovind that the election to the seat be cancelled after cash amounting to Rs 11.50 crore was found in a warehouse linked to the Dravida Munnetra Kazhagham party's candidate Kadhir Anand. The Congress and Bharatiya Janata Party's rallies, meanwhile, will continue unabated on Tuesday, the last day for campaigning before Phase 2 of the Lok Sabha election on Thursday, 18 April. The Congress chief's BJP counterpart too will be in Kerala. Amit Shah will address two rallies at Thrissur and Ernakulam, and two others at Karnataka's Tumakuru and Davanagere.